Here’s an oldie but goodie: refrigerator pickles. I remember making a version of these with my mother when I was in grade school. We’d pickle cucumbers whole in a simple brine, with plenty of garlic and dill. Then into the fridge they would go, for a couple of days and sometimes longer, before we could get at them. At the time, it seemed like an eternity to wait, especially for little pickle-addicted me. 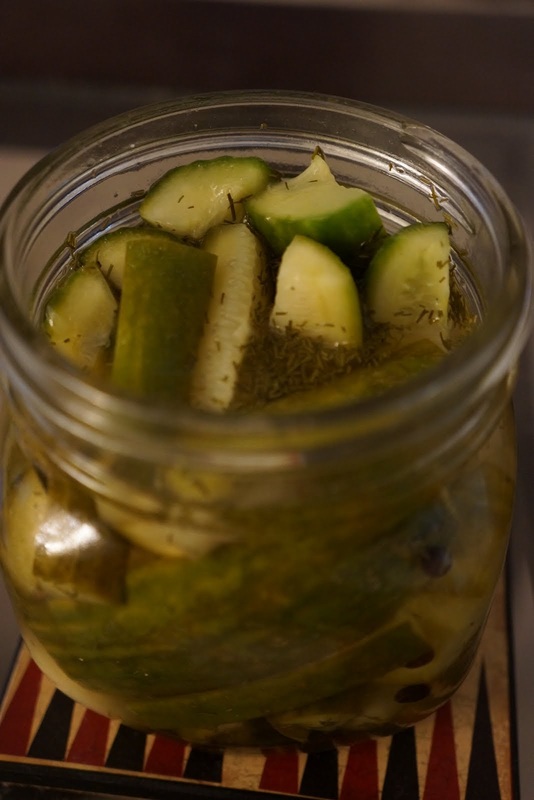 After a while, I made up my mind that I didn’t really like refrigerator pickles, partly because they didn’t taste much like the supermarket pickles I was used to, and partly because they took so gorram long to be ready. I know better now, of course. In fact, I think I even prefer refrigerator pickles to their pressure-processed counterparts. Without a sustained dose of heat to make them shelf-stable, the pickles retain some of their original snap, and the flavors in the brine stay sharp and unmuffled. On top of that, refrigerator pickles are a great way to play with flavoring agents, finding the combinations that hit the spot on a particular day, in a particular mood. The last time I made a batch, I threw in some allspice on a whim, and ended up loving it within the classic mix of garlic and dill; next time I’m thinking I might go full-on spicy, with some chili peppers and maybe even hot sauce in the mix. Even the best refrigerator pickle recipes are templates, not rulebooks. As long as the proportions of vinegar and salt in the brine, and the ratio of brine to vegetable matter, stay about the same, the sky’s the limit. And not just with cucumbers, either; I’ve got my eye on pickled radishes next, and after that it’s on to pearl onions, baby carrots, and maybe even green tomatoes.